Review: A timid clownfish sets out on a journey to bring his son home after he is captured in the Great Barrier Reef and taken to Sydney. A very colourful and bright film. Also very enjoyable and one that the whole family can sit down and watch. It is a very delightful film. There are jokes in this that children can get and also parents. The animation is breathtakingly beautiful. As of September 2015 this is the bestselling DVD of all time in the world, with 41 million copies sold. This is the first role ever written specifically for Ellen DeGeneres. 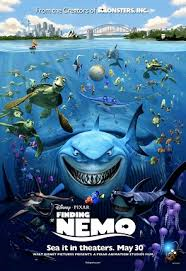 After the films release there was a huge demand for fish especially the clown fish and the blue tang. There is a scene in this of Buzz Lightyear from Toy Story (1995) and he is on the floor of the waiting room. The themes that occur are Friendship, Trust, Family, Perseverance and the willingness to be Independent. At the Academy Awards in 2004 this won one Oscar and that was for Best Animated Feature.